For many people, the idea of nesting bees usually brings to mind a vision of a beehive with resident bees buzzing in, out, and around the opening. This is true of some, but other bee species prefer the ground to set up their nests. One prolific species found in the midwestern and northeastern portions of North America is Colletes. This busy bee is a loner, meaning the female takes care of constructing her nest. While she is considered to be solitary, it is not uncommon for a multitude of females to build their nests’ side by side. In this case, you may find small mounds of soil or sand with a hole in the middle where the female lays her eggs. Depending on the landscape, the nests may be visible. Not all bees can sting. For example, the male Colletes inaequalis does not have a stinger, and the female uses her stinger only if being attacked. Bees serve an important ecological service in providing pollination for fruit, trees, and flowers. Therefore, using chemicals to eliminate them is not always the best option. NJ pest control specialists are aware of this and take precaution when removing bees from a property. For information about bee removal, the type of services we provide, and an inspection, contact Stern Environmental. Our NJ pest control experts handle problems quickly, efficiently, and safely. Why Are Hornets a Serious Problem for Businesses and Home Owners? We see them all the time whenever we’re outdoors; insects. Whether crawling, walking, or flying, Mother Nature has provided a smorgasbord of insects for us to share the environment. This works out fine unless we happen to get in the way of one of these social species: the hornet. There are two genera; Vespa (22 species ) and Provespa (3 species). The Provespa species, unlike the Vespa, are nocturnal. In North America, the European Vespa hornet is most prevalent. 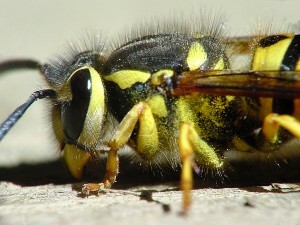 Hornets are often confused with yellowjackets due to their similarity in appearance. Their distinguishable characteristics include a distinctive head and an elongated rounded abdomen. In size, some species can grow to over two inches long. There’s an old saying about “stirring up a hornet’s nest,” which means when applied to a human situation you want to avoid causing trouble. When applied to hornets, this is something you don’t want to do deliberately for any reason. They’re already an aggressive species without any provocation, but when their nests are in danger, they become even more so and attack anything in sight including humans and pets. Due to their aggressiveness, hornet nest removal is best left to a professional service with trained staff and appropriate solutions. 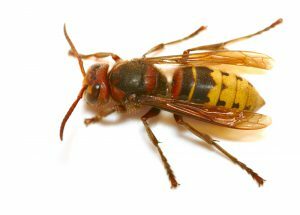 At Stern Environmental, our hornet nest removal process will rid your home or commercial building of these unwanted pests. Call today to schedule an appointment. Identifying Hornets and Their Nests Can Help Reduce Stings. NJ restaurant bee and wasp abatement is a critical step in keeping your customers sting free. While patrons dining in the restaurant’s patio area might like a little “bite” to their meal, there’s no doubt they’d rather it be in their food than on their bodies. The following are known problem makers due to their attraction to nearby nesting places (eaves, trees) and accessibility to food, fragrances, bright colors, and proteins. Whether a customer is stung once by a honeybee or multiple times by a single aggressive wasp, it causes pain to the victim. In the case of those who are allergic to bee stings, it can be a fatal situation if an antitoxin isn’t administered within minutes of the incident. For restaurateurs with outside dining, the possibility of this type of situation should be avoided at all costs. Bees and wasps usually stick to themselves, but if provoked, or their hunt for food takes them to your customers, stings may be part of your diner’s menu. Avoid attempting removal of hives or honeycombs yourself. Leave that to the professionals. If you’re in need of NJ restaurant bee and wasp abatement service, Stern Environmental has the personnel and equipment to keep the buzz at bay. Give us a call if you have any questions or to schedule an appointment.